The Napa Valley is the quintessential American wine region. Napa helped the USA gain the recognition it deserved in the wine world, and to this day, still brings the thunder. It's the wine region everyone knows and loves; but do you know the story of how it came to be? Find out on this premiere episode of V is for Vino. or scroll to the bottom to watch the episode by chapters in the "EPISODE BREAKDOWN"
use code "VVINO" on checkout to get 10% off! If you asked your beer-only-drinking-uncle what wine region he knows, he’d say the Napa Valley. There’s no region more iconic in the American wine scene. Napa is credited with giving American wine the street cred it needed to hang with the France and Italy’s of the world. It has an allure and prestige surrounding it that screams luxury. Consequently, the price of land is through the roof. Wineries who own it tend to be split into 2 camps: wineries who bought their land when it was cheap, and are now mega producers (think Mondavi) or new money from tech or celebrity, making wine as passion projects. Nothing wrong with either, but in order to find wines that have some value and craft to them, you gotta dig a little deeper. Small producers making affordable wines are few and far between. But don’t worry, V is for Vino has you covered. Wait I thought we were going to talk about Cabernet? Well there’s a little secret in American Cabernet: it’s usually not 100% Cabernet. Let’s back up. A place in France called Bordeaux makes Cabernet based blends very very well. American wine producers, as they do often, took a cue from their French counterparts and made the same kind of blends here. But here’s the catch: only 75% of the grape varietal in an American bottle has to be what is listed on the label. So many wines listed as Cabernet are actually Bordeaux blends. 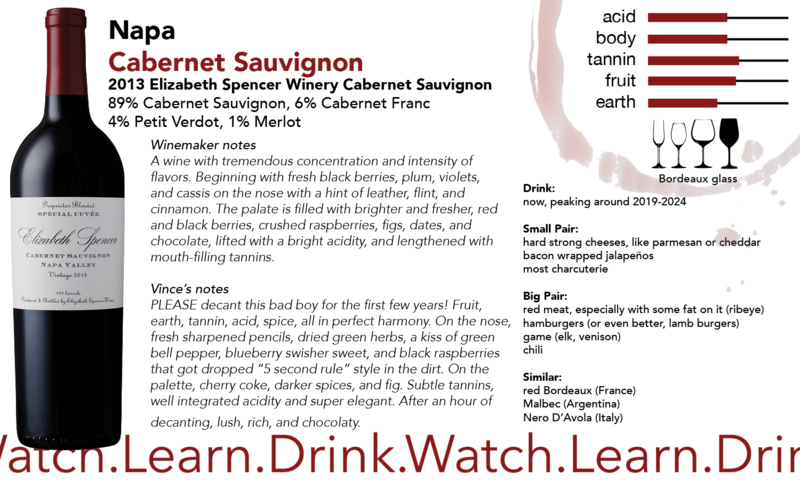 So your “Cabernet Sauvignon” may be actually have a little Merlot, Petit Verdot, Cabernet Franc, or Malbec in it too. These help “round out” the blend. So how do you know? 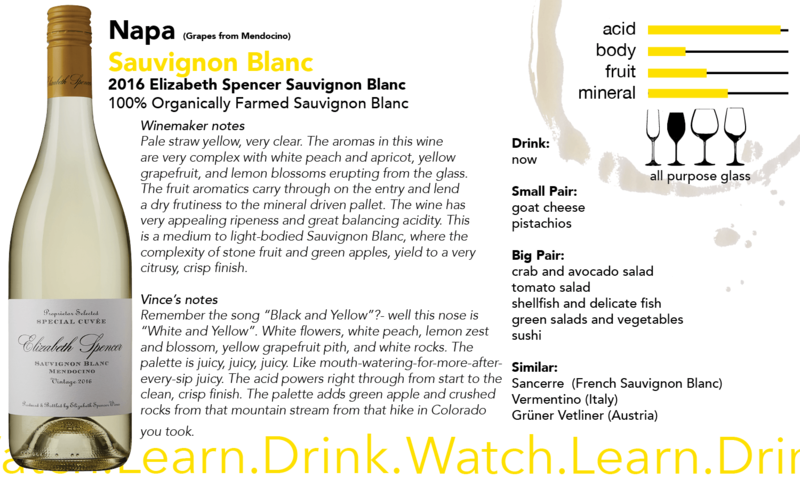 Some wines will put it on the back of the bottle, but to be sure, go to their website and check out the “tech sheet” for the wine, often found under the “Trade” section of the website. Napa Cabernet tends to be big, bold, dark wines. Think cassis, currant, black cherry, and blackberry fruit flavors. Oak aging, which it often has, tends to give it cigar box spice and vanilla notes, and time usually adds flavors like leather and earthiness. Because the wines have a high amount of TANNIN (watch the episodes “NERD LAB”) the wines can age very well, and pair very well with fatty foods. Just like Cabernet Sauvignon, Sauvignon Blanc is grown and loved by many winemakers and regions. Like American politics, it takes different forms depending on where its from, but it almost always has a HUGE amount of acidity, which is great for food pairing. Also, you can usually count on green being a factor; grass, lime, gooseberry, jalapeño, green apple. But flowers, other citrus, stone fruits, and even mango or passion fruit can come into play too: it just depends where its from! Elizabeth Spencer is actually two people: the husband and wife duo of Elizabeth Pressler and Spencer Graham. I fell in love with ES by chance. I wandered in their tasting room on a whim for my final tasting of the day. They were closed, but Kathy in the tasting room served me anyway. I instantly fell in love, but couldn’t seem to get them on board for an episode at the time. Fast forward 3 months later, and my wineries for the Napa episode just kept falling through. I just couldn’t find someone who I felt represented Napa while still bringing that price to value ratio that I look for in V is for Vino. On a whim, I followed up one last time with ES, and 2 weeks later, we were filming with winemaker Sarah Vandendriessche. The wines are restrained and elegant, just like the brand. No gaudy tasting room or gimmicks. Just great people, and great grape juice. Is the Cab a bit of a splurge? Sure. Is it worth it? Absolutely. TORC is whatever Chef and owner Sean O’Toole wants it to be. He plays the music he wants. He cooks the style of food he wants on any given dish. He uses the ingredients that come to him, not the ingredients that happen to be popular right now. He worked hard to open his own spot, and he wants to live or die by his own sword, which is something I totally respect. He calls it “contemporary Californian”. I call it delicious. 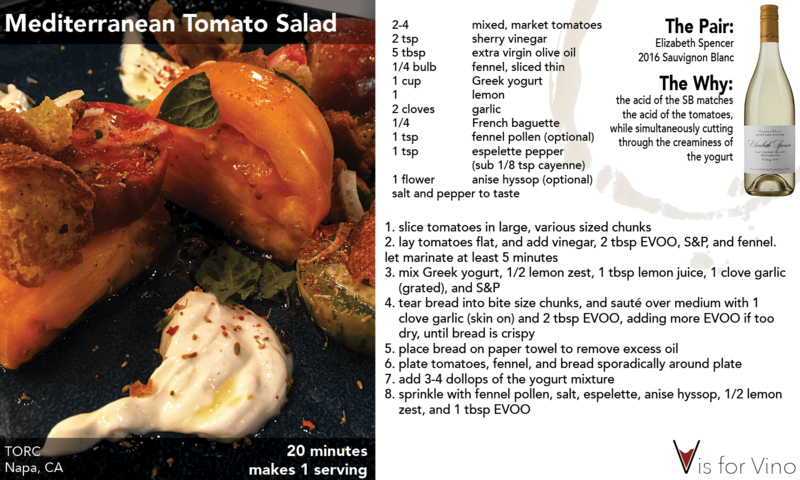 We started with a Mediterranean tomato salad, as visually stunning as it was delectable. 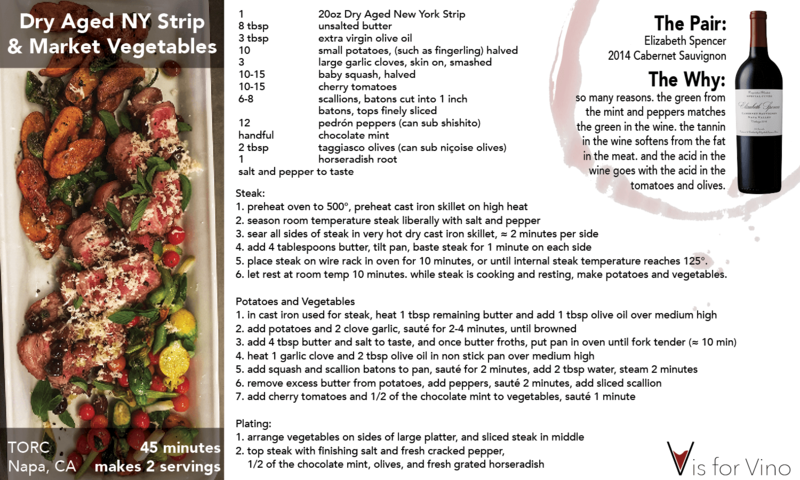 And then, the steak; it changed the way I see NY Strip. Forget steak here, potato here, vegetable here. The dish is a complete work, each flavor complementing each other, as well as the wine. You do you, Chef Sean. There was a time that the French dominated what was considered “fine dining” and “fine wine”. The “Judgement of Paris”, as it came known to be called, put an end to that. The story of how Napa put American wines on the map is too cool to simply put in text, so watch the video and enjoy a little helping of the US of A.
Tannin the element is wine that is the most challenging to grasp. It can’t be measured in the way sugar, acid, and alcohol can. Wine makers must use a lot of instinct to balance tannins in their wines. It’s a compound from the skin, seeds, and stems of the grapes that contributes to a wines bitterness, structure, and age-ability. Watch the “NERD LAB” for more, and read the BLOG POST ABOUT TANNIN for more even more info!